Sailor Jerry, born Norman Collins in 1911, is considered the prodigal grandfather of the Americana tattoo culture and style. The white haired, mustached artist would ink his clients while smoking a pipe and chatting about his war days. Today both he and his ink are legendary. Both the original designs and letters of Collins are currently protected by Sailor Jerry, Ltd., which is owned by Norman's protégés, Michael Malone and Edward Hardy. The onset of this historic career began when a young war torn Collins took up residency in Hawaii's Chinatown as a young apprentice to native artists there. He learned traditional Polynesian and Asian methods and honed his own style now known as the standard in the modern tattoo industry. Once you have seen a few Jerry tattoos, you start to sense a theme. Bare women with long lashes, lots of wild and poisonous animals, ships at sea with large and multitudinous masts, dice, bottles of booze and other symbols that epitomize the American male persona over the past 50 or so years. 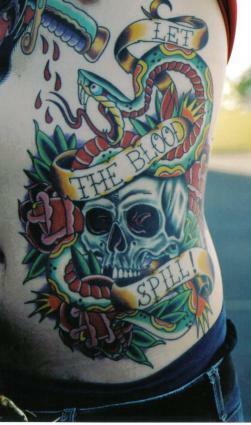 Essentially anything that can be used as a symbol of what Collins would have called "Man's demise" can be incorporated into a Jerry styled tattoo. The overall message most of the time is that you cannot win for losing, nothing is going to go your way and of course, hard times have shaped you and made you are hard - and hard to deal with man or woman. How Has It Lasted So Long? The Sailor Jerry tattoo story is a long and tumultuous one that deserves respect and recognition. 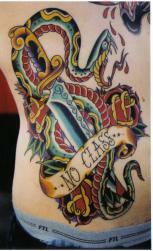 The work of Norman Collins may come in and out of style as other types of tattoos take the front seat over years. That being said, Kanji tattoos, tribal tattoos, other kinds of Americana (mainly influenced by Jerry designs) and Chinese tattoos go in and out of style cyclically while the work of Collins lives in. A Sailor Jerry may not always be in the mainstream, but the overall message and style resurfaces all the time and enjoys a great deal of popularity when it does. There are many Hollywood A listers and other famous people with Jerry tats or ink that is clearly inspired by the work of the late Norman Collins.